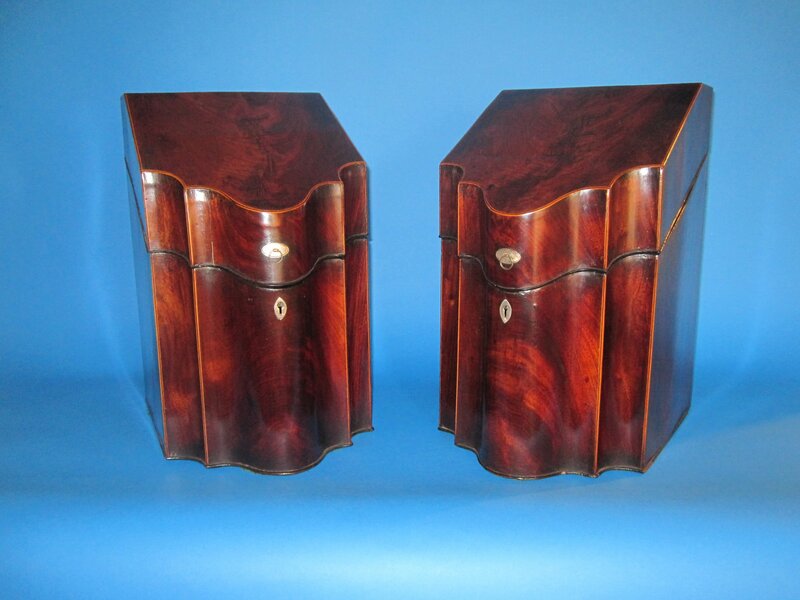 PAIR OF MAHOGANY KNIFE BOXES. GEORGE III, CIRCA 1790. A GOOD PAIR OF LATE 18TH CENTURY MAHOGANY KNIFE BOXES. GEORGE III, CIRCA 1790. Each lidded box with flame mahogany veneered sides front and top with satinwood & ebony line stringing, and with fitted interior with star and feathered inlaid design to lid interior. Silvered mounts. Circa 1790. Provenance: formerly the property of the late Sir Norman Hartnell, Royal couturier.